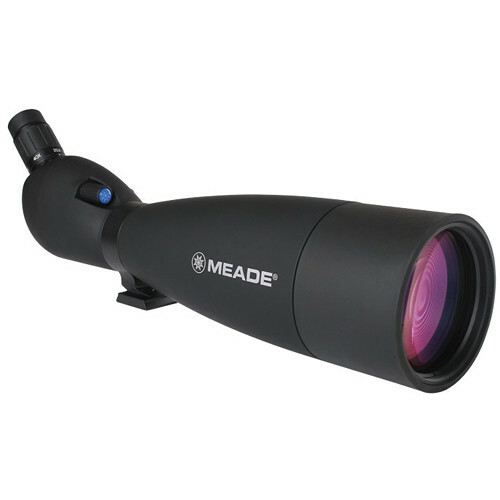 This 45° angled-viewing 20-60x100mm Wilderness Spotting Scope from Meade features fully multicoated optics, and powerful 20-60x zoom magnification eyepiece that provide clear and bright images when viewing at long range in all weather conditions. Its extra large 100mm objective lens gives the scope enhanced low-light performance over smaller objectives to spot and track game and wildlife at dawn and dusk, or under a heavy forest canopy. On the right side of the body is a fast-focus knob and on the left is a sight tube that runs parallel to the optical tube to help you find your subjects faster. The aluminum alloy housing is nitrogen-filled and o-ring sealed to be water and fogproof. It also has a rubber armored exterior that protects it from impacts. A digiscoping camera attachment is included that slides over the eyepiece, and accepts most user-supplied camera-specific T-mounts. Box Dimensions (LxWxH) 26.77 x 8.425 x 7.087"
20-60x100mm Wilderness Spotting Scope (Angled Viewing) is rated 1.0 out of 5 by 1. Rated 1 out of 5 by John the Birdman from Don't Waste Your Money In a few words, this scope has horrible optics which produced severe chromatic aberration. It was so bad that it rendered the scope unusable for all but casual observations on the lowest magnifications.That's really too bad since Meade has always been known for its excellent optics. B&H Photo gave me excellent customer support in arranging to have the scope returned, but it's a shame that a retailer with such a great reputation has to carry a scope with such poor optics. I would not recommend this scope to anyone for any reason. Can I get a tripod accessory with this scope? Well the scope comes with a Tripod Mounting Shoe so that it can be mounted on a tripod. What type of Tripod Accessory do you mean?